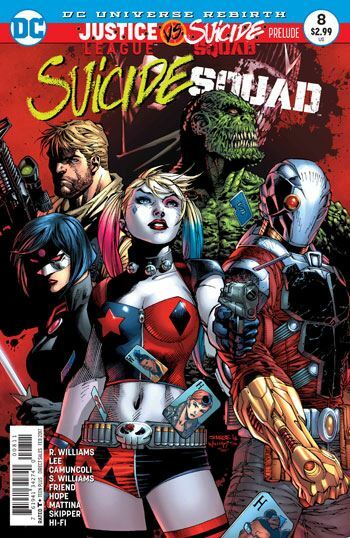 As usual, there are two stories in Suicide Squad #8. The cover ignores the first one. The opening tale serves to conclude the plotline that has run over these first issues, bringing a wonderfully chaotic climax to it, as madness reigns throughout Belle Reve. 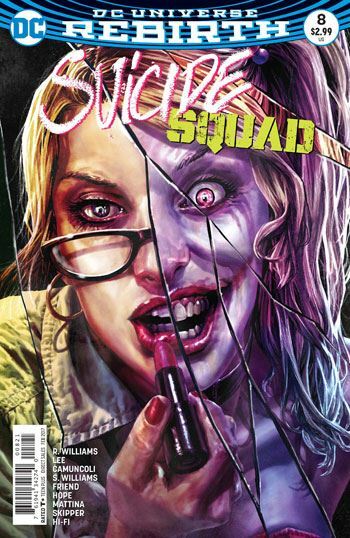 In the previous issue, the black sphere that the Squad had retrieved from Russia had its energies permeate the prison, driving everyone crazy, except for Harley Quinn, who it makes sane. Harley is the main character in this follow up, doing her best to focus the other characters on their survival as a whole. It makes for a great role for Harley, and the madness provides some entertaining parts for the other characters. Enchantress finally gets a decent role for a change, and Rick Flag, Hack, and Amanda Waller all get some standout scenes. There are some surprises along the way, one that made me very happy, but despite the team’s triumph, the conclusion, with Harley back to her crazy self, puts a sad damper on it all. Very fitting. The second story is the one cover billed, the prologue to Justice League vs Suicide Squad, but really it’s more of a Killer Frost solo story. Now named Caitlin Snow, to match the character from the Flash tv series, Killer Frost is the latest inmate sent to Belle Reve, and the newest recruit for the team. We follow Frost as she enters the prison, gets introduced to the other members of the team, and has her first meeting with Amanda Waller. It’s not a bad story in any way, but neither tale in the issue really felt like an introduction to the upcoming crossover. I would have been more pleased with this issue if no mention had been made of the Justice League at all.